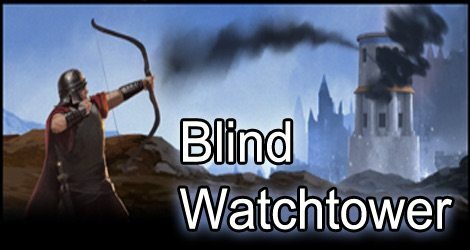 The Blind Watchtower item has just been released in Beta. Much like the instant execution feature I believe MZ will only release this in gold packs. 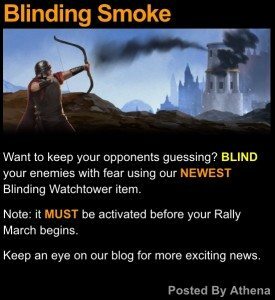 If you use this item before your Rally marches, you march will be completely hidden from the opponent’s watchtower. Presumably this will mean that not only will they have limited information about the rally, but also that they will not receive a notification that it is coming. This isn’t a new “feature” it’s been around for years. It used to be called lag MZ just changed the name and added a price tag. So you’ll still know you’re being rallied. You just won’t be able to see the troop makeup of the rally. I see this only being used in wonder battles. Also they just announced Hero level 60 is coming soon in Beta. Just way to many things being implemented imo while they still have unfinished projects i.e. alliance city (complete waste of gold and rss). This one can’t pass the beta. In same vein as that guardian shield. Stop crying and think for a minute. Going by the little bit of info given here, this could be a fun feature. Smart players will have little to fear from this. Careless players OTH . . . well you guys complain about everything so nothing will change. I can see this being most effective for Wonder rallies, making them far more exciting. Who knows, this could even give people a chance against StayAlive at the Super Wonder. If he doesn’t know what’s coming, you might be able to hit him with just the right missile. If everyone times their war marches just right so that the rally starts as soon as everyone’s troops arrive he won’t even be able to scout you to see which troops you’re sending. This is exciting, guys. Embrace it. As a former ~500mil player before leaving the game recently, I don’t think this will prohibit anyone from helping in rallies. Whenever I joined rallies at the Wonder I immediately was rallied by the enemy since I was one of the weakest players there. I never got hurt. This new feature would just mean players like me would have to be more vigilant. Besides, what fun would this game be if there was no risk involved? Why are people bleating about spenders being too powerful? This isn’t the communist Soviet Union. Without spenders, there would be no GoW. It’s free to play, not free to win. Get over yourselves and get your wallets out. This is a handy boost worthy of a few bucks investment. I could go either way with this, depends on HOW it is implemented. 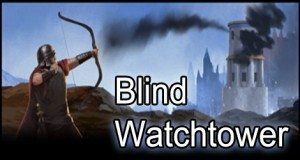 For instance if we get a notification through the watchtower that the watchtower has been “blinded” or some such, for a particular period of time, that could be interesting. You could use them to fake people out. Blind them when you aren’t actually rallying to see if they shield or not. I can see this being an ineresting feature, but it all depends on how it works. 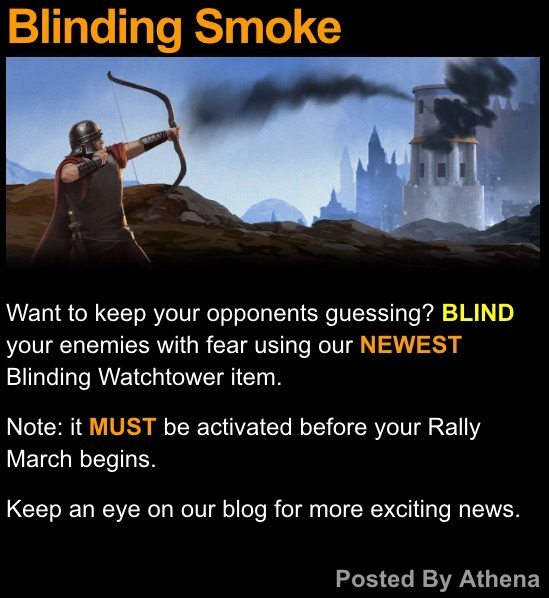 I wish everybody would stop their crying…this is a GREAT feature…either shield up, ghost rally, or have your war gear ON AND READY (and build for any type of march that could be sent your way)!! Name of the game is protect yourself at all times…or get zero’d!! With an alliance that works TOGETHER, this should be no problem to counter if needed!!! Obviously you are in a young kingdom Kotchie because you cant ghost rally 12m troops. This is as bad of an idea as the guardian shield. Especially if it blocks notifications. 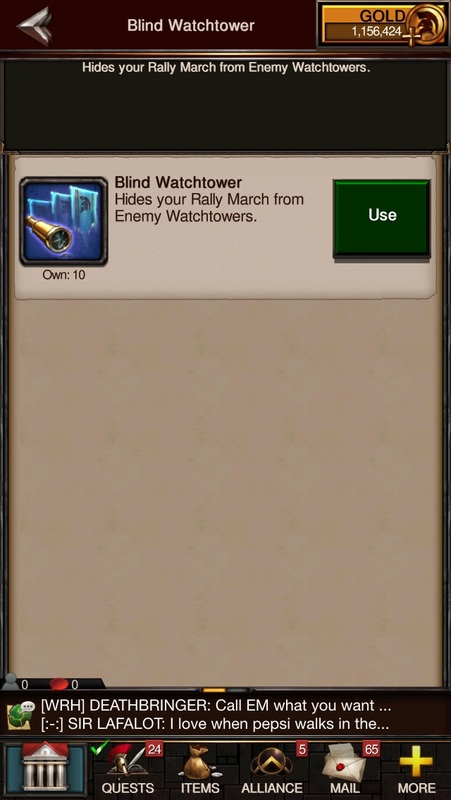 But don’t worry I’m sure MZ will introduce a debuff that you can research to unblind the watchtower. So stupid. There already isn’t a notification if a rally is set on you. Then they added Rally timer reduction, easily the dumbest thing ever implemented. Now they are taking away potentially the only way to react to a Rally. Along with the only chance to “counter” a rally buy quick equipping cores once you see the Rallies composition. Just more ways to Overpower the big spenders. Frustrating. geez, so someone can march on you without you even knowing? Very dangerous. 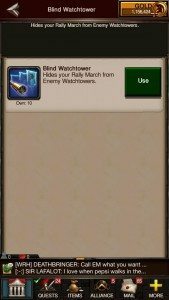 Probably will have another option to pay money for activating a Prestige Watchtower in the future that can’t be blinded. MZ trying to milk money from both sides in every fight to spend more money. Please no. May this fail utterly. Presumably this will work on wonder rallies. This is a total game changer. No longer can one rely on notifications to pop on and defend against a rally!